A surprisingly entertaining film that ignores credibility with delightfully wanton results. All realism and credibility is thrown out of the window in this delightfully macho celebration of the 1980s action film. The action scenes are huge, loud and fantastically violent. It blends brutally choreographed mêlée, explosions and gunfights, with each one of the Expendables having their fair share of the action. However, although the film is satiatingly steeped in aestheticised violence, I did find that some of the CGI violence wasn’t as tangible as I’d have liked, I prefer old fashioned squibs and syrup. This is unfortunately a problem in many modern films, even in the incredibly violent ‘Rambo’ (2008). The plot is a simple, familiar one; it follows the Expendables as they infiltrate and overthrow a Latin American dictator, with the token sinister executive thrown in there for good measure. Away from all the wanton destruction are parts that are surprisingly character driven, particularly the chemistry between Stallone and Statham, whose tough, competitive camaraderie may be somewhat clichéd but certainly entertaining. As the image above suggests, a terrific cast has been assembled, it includes: Sylvester Stallone, Jason Statham, Jet Li, Dolph Lundgren, Terry Crews, Mickey Rourke, Randy Couture, Steve Austin and even cameos from Bruce Willis and Arnold Schwarzenegger. 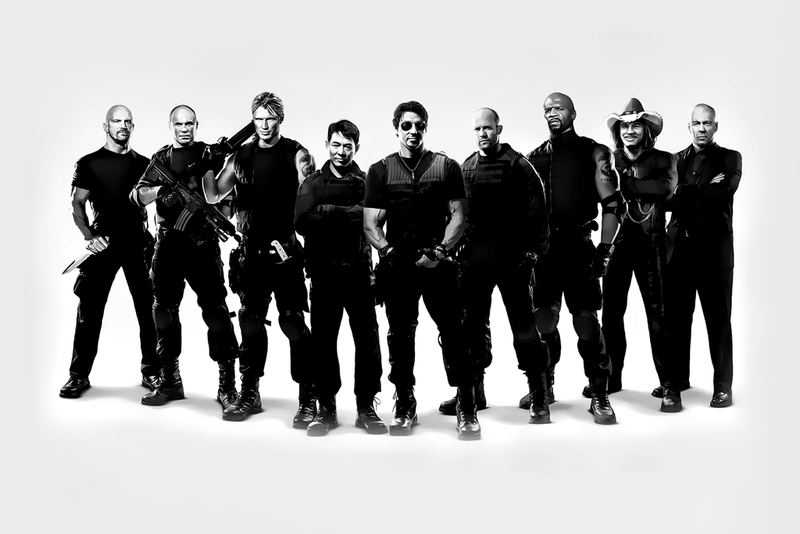 There are some notable names missing from the cast, but thankfully there’s scope for a whole Expendables franchise, giving many other fan favourites an opportunity to become an Expendable. This is probably the first time that I’ve found myself wanting a mindless blockbuster franchise to come to fruition; with a team of cine-literate, witty writers, the possibilities are almost endless for potential sequels. Who knows, the film could even attract some heavyweight talent in the form of Clint Eastwood, Robert De Niro and Al Pacino – ‘The Expendables’ could add further dimensions to its celebration of masculinity! Perhaps my satisfaction with the film was accentuated by my low expectations coming into it, but I think I would’ve enjoyed it regardless of expectation; it delivered the masculine, ridiculously excessive carnage that, for me, makes it a funny, exciting break from reality – I left the film with a big smile on my face.